The holidays are soon approaching. The last month is usually the busiest time of the year for many shops. Since most people are engaging with their favourite stores online and offline, businesses need to make preparations for their campaigns, including email campaigns. With the help of email marketing, you can help increase your sales. Email campaigns are effective tools for letting people know about current deals, items in stock, and other relevant events. It has become common practice to include GIFs in email designs. After all, GIFs add a fun element to your newsletters. Animated GIFs can easily liven up any email that will help catch your subscribers’ attention. Whether you use snowflakes, reindeers, presents, etc., GIFs can add an extra dose of cheer to your email designs. Why do we like it? The GIF is quite unique with cartoon-like animals carolling. However, the animals are not adorned with Christmas-themed clothes or objects. If you take a closer look, then you will notice that the sheet music books that the animals are holding do not bare any Christmas-themed music titles. As a result, the GIF gives hints of holidays without necessarily being denomination-specific. When it comes to GIFs, do not limit yourself to common holiday-themed animations. You do not need to create GIFs that are explicitly holiday-themed. If you do not want to use GIFs with a snowman, carollers, reindeers, etc., you can opt to create GIFs with normal items. For instance, you can animate graphics or shapes that you normally use from your regular newsletters. Then, feel free to change up the colors of the graphics for the holidays. 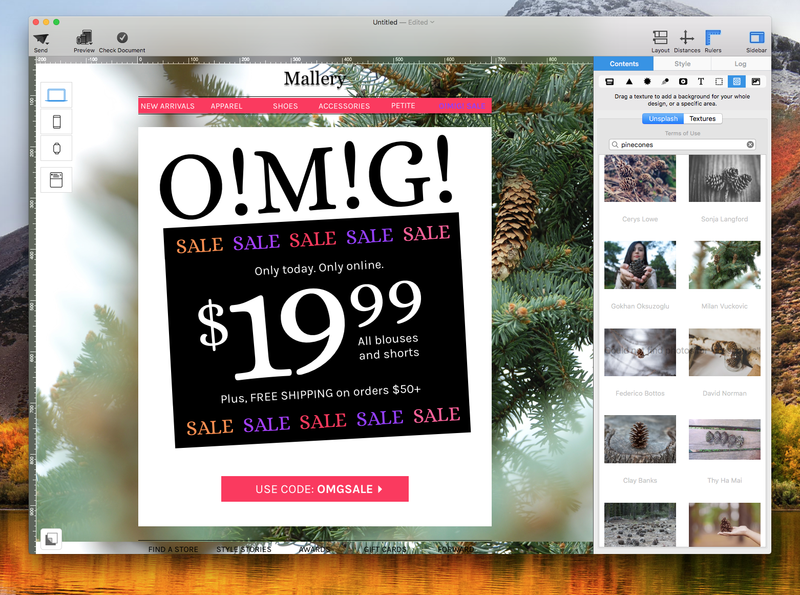 Tip: In Mail Designer 365, you need to make sure to only drag one GIF per one image area. Since there are many good deals available during this time of the year, we recommend choosing your best deal. Then, you can add emphasis by placing your best deal at the center of your email design. This way, it cues your subscribers to recognize that this deal is the one to pay attention to. Did you know that you can also use a GIF as your CTA button? You can spice up your CTA button by using an animated button. For a festive look, try playing with colors. Tip: You can save this GIF by right clicking and choosing “Save.” Then, drag the GIF from the location the you saved it to directly into an image area. For another festive look, we added colorful stars to our CTA button. This CTA button is a little bit more versatile compared to the candy cane button. You can use this button for other occasions outside of the winter holidays. For instance, you can use this button for Fourth of July, Veterans Day, etc. Tip: Feel free to save this GIF by right clicking and choosing “Save.” Then, drag the GIF into an image area. 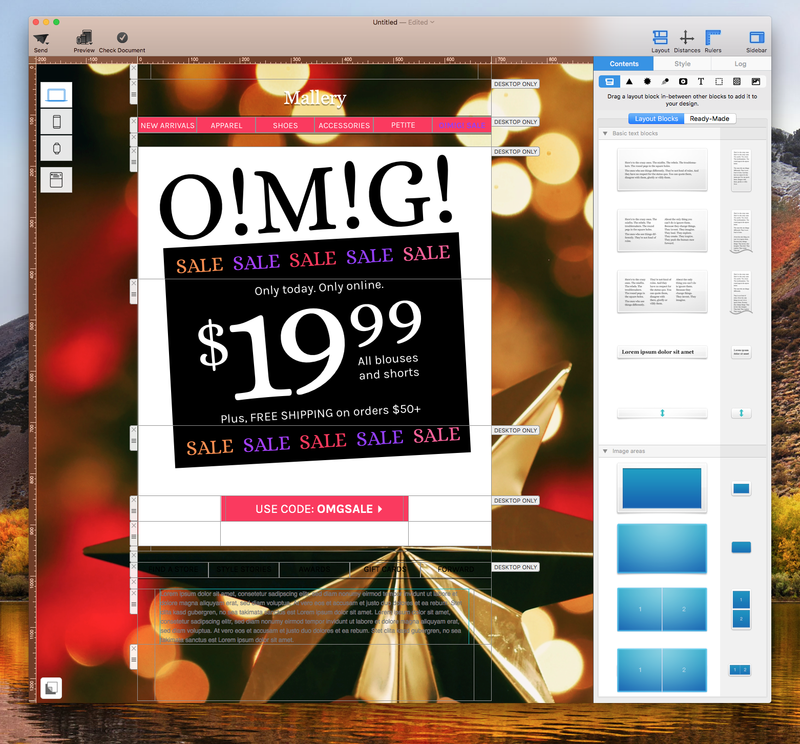 Extra tip: In Mail Designer 365, you can also drag the GIF into the “Custom” area for future use. Since different people celebrate different holidays during this time of the year, you can stay denomination-neutral by using imagery that gives winter vibes. You can use pictures of snow, snowman, pinecones, hot chocolate, sledding, etc. Use imagery that reminds you of the winter holidays but not necessarily a specific holiday. This way, you are not alienating a good portion of your subscribers. Nothing screams holiday festivities like gold and glitter. It’s the season of gift wraps, ribbons, and shiny decorations. And email newsletters are no different. You can make any newsletter more festive just by adding images or text with glitter. Why do we like it? The newsletter is simple and minimalistic, which perfectly matches with Are You Am I’s branding. The touch of glitter on the word “Sale” adds the holiday vibes, while staying true to the brand’s identity. Holiday greetings are a must this winter season! Reserve at least one day in December to greet your subscribers. As we mentioned earlier, it’s important to not alienate any of your subscribers during the winter holiday season. Although we recommend greeting your subscribers during the holidays, we suggest using non-denominational holiday greetings. Why do we like it? 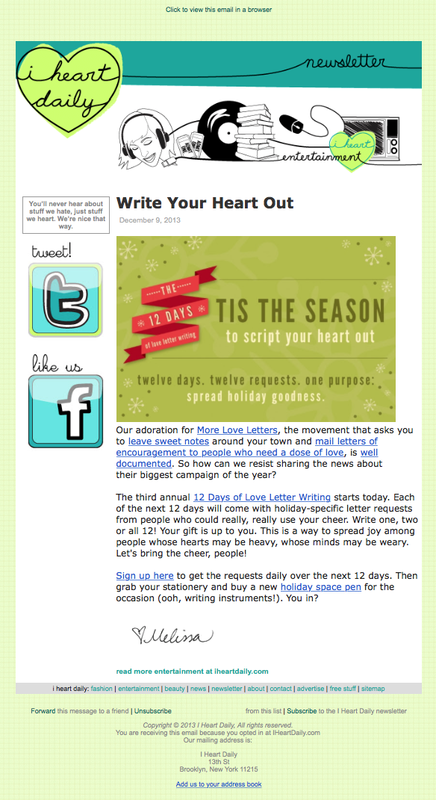 Kiehl’s wrote “Happy Holidays” right at the top of the newsletter, so it’s hard to miss. The background of the above portion is blue with snow and snowflakes falling. The non-denominational imagery matches the neutral headline. This technique is a great way to be able to greet everyone. Also, Kiehl’s included an added bonus: a $20 voucher. Subscribers will appreciate any opportunity they can save, especially when it’s holiday shopping season. If you want to make your customers happy, try creating a gift guide with your products. This is not only a great way to showcase your different items but is also a thoughtful way to provide your customers with information. Also, remember to provide your subscribers the name of your items to make it easier to find in your online and your physical stores. Tip: When it comes to gift guides, the layout makes a huge difference. Make sure to add some empty space in between the items. Otherwise, your gift guide may look overcrowded and unappealing. Why do we like it? Toffee‘s newsletter is relatively holiday-neutral with pinecones, burlap string, and a present wrapped in brown paper. The items are not clustered together, and there is a fairly decent amount of empty space in between the items. On top of that, Toffee makes it extra easy for readers to know the name of the item with labels right under each item. Why do we like it? Even though Forever New targets only women, the company cleverly creates 3 different gift guides: Gifts for your sister, gifts for your best friend, and gifts for your KK (Kriss Kringle aka anonymous Christmas gift giving). On top of that, the brand also provides a choice of searching for gifts based on price. This makes it a lot easier and more convenient to shop. This is the perfect time to host giveaways. As most people make plenty of purchases, it’s a great time to squeeze in an opportunity where people can win something. 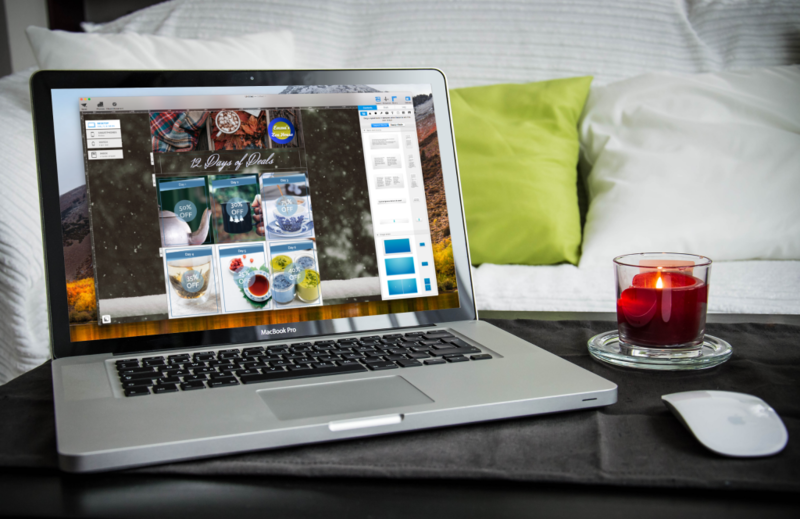 Try hosting giveaways on your website or on one of your social media pages. The choice is yours. As long as you set signing up or following your page as a giveaway requirement, giveaways are effective motivators at getting people to opt-in to your list or to follow you on social media. Why do we like it? Eggie is using a giveaway to help increase the number of their instagram followers. Also, by requiring people to tag 3 friends, the giveaway helps increase brand awareness. When people include others from their own inner circles, the brand has potential access to those individuals that they may have not been able to reach on its own. Why do we like it? 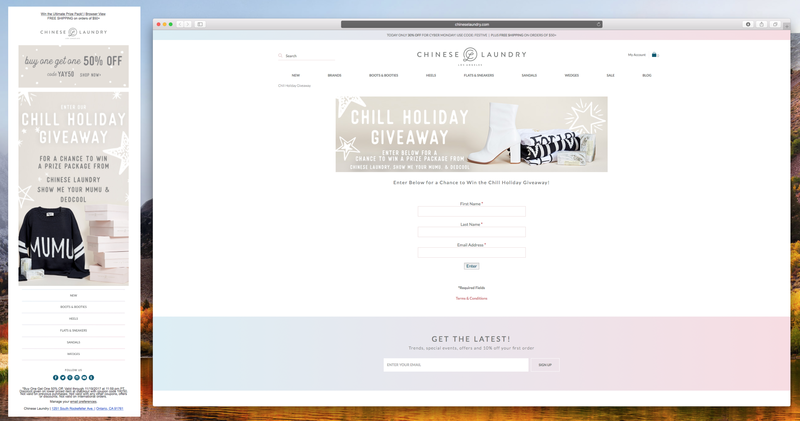 Chinese Laundry named their giveaway as the “Chill Holiday Giveaway.” The name of the giveaway does not allude to specific denominational-holidays like Christmas. Also, the stars background and the toned-down gold give the newsletter a neutral holiday vibe. The CTA button in the newsletter leads to the giveaway landing page. As you can see, there are only 3 fields required: First name, last name, and email address. The requirements are simple, short, and easy-to-do, which anyone can appreciate. Tip: Regardless of the prize, giveaways with complicated rules and requirements will push many people away from signing up for the giveaway. The simpler, the better! 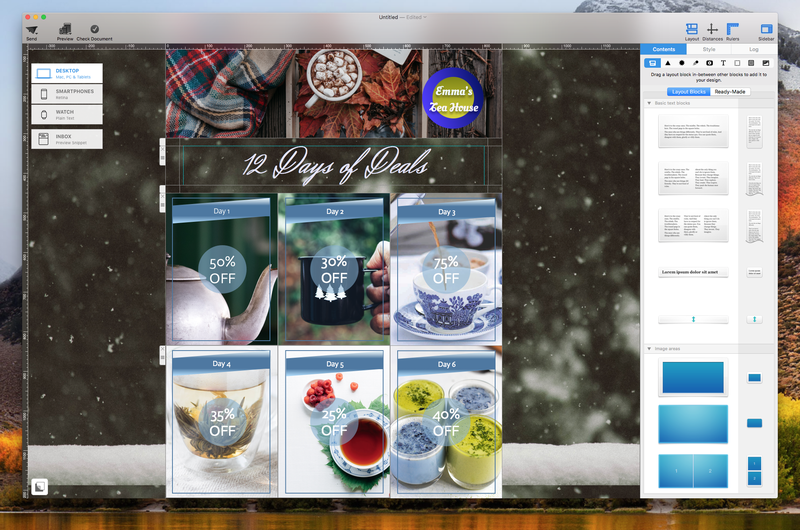 To help ease your email design life during this busy season, make sure to save specific layout blocks that you want to re-use again and again for the holidays. This can be your logo, social media icons, holiday greetings, holiday deals, etc. 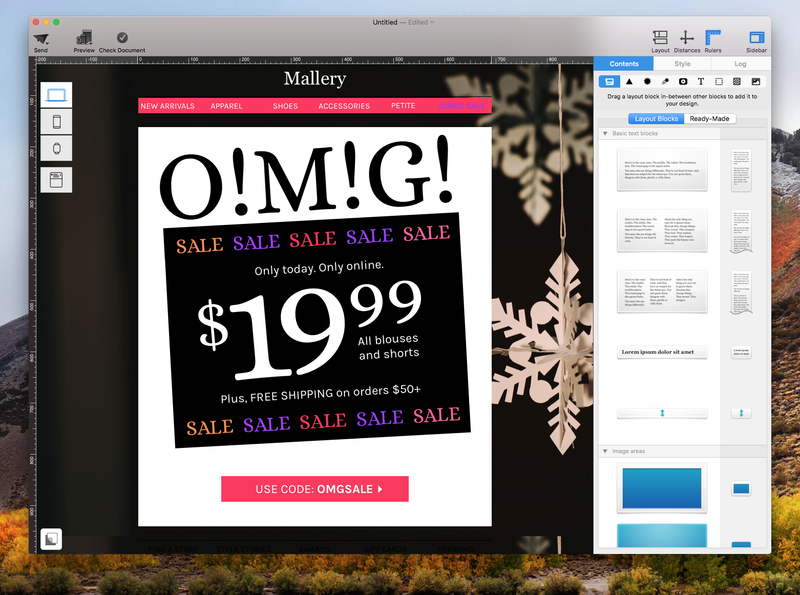 It will make it so much easier and faster for you to design your holiday email campaigns. Tip: Drag the layout blocks that you consistently use into Mail Designer 365’s “My Instant Blocks” under “Read-Made.” This way, you can just drag those layout blocks into any newsletter henceforth. You will no longer need to recreate those layout blocks again and again. 11. Plan ahead with the help of a calendar! The holidays are a busy time for everyone. As a business, you will probably need to send out multiple different email newsletters. Use a calendar to organize when to send which campaign. Make sure to double-check which deals are available on which days to ensure that you do not send a newsletter at the wrong time. For calendars, you can decide whether you want to use a hard-copy calendar or a digital calendar. There are many options to choose from. Before deciding, make sure you understand what you and/or your team needs. Some calendars will send reminders on your smartphone, some calendars allow you to integrate with your email accounts, etc. You can also use Calendar found on your iMac or MacBook. 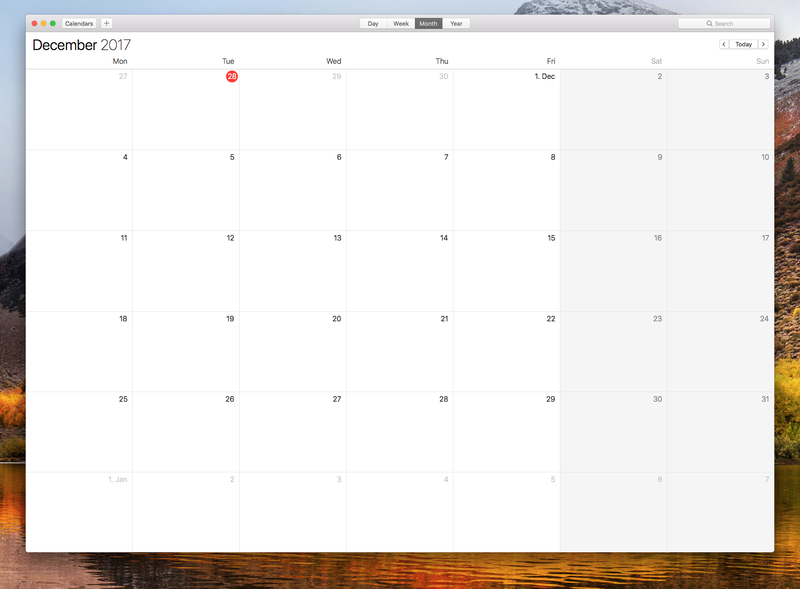 For more information on how use your Mac’s calendar, please visit Apple’s support page. The song has been traditionally sung by carollers and church choirs year after year. Many people all over the world are familiar with this song, even those who do not celebrate Christmas. Over the last couple of years, you may have noticed that many companies have decided to use it as a marketing campaign. However, instead of marketing “12 Days of Christmas,” we recommend using “12 Days of Deals.” This way, you can make everyone feel included. Tip: You can also create your own “12 Days of…” Based on your brand and the items/service you are selling, you can decide what you name your campaign. In fact, many companies have put their own twist on the 12 Days campaign. Why do we like it? 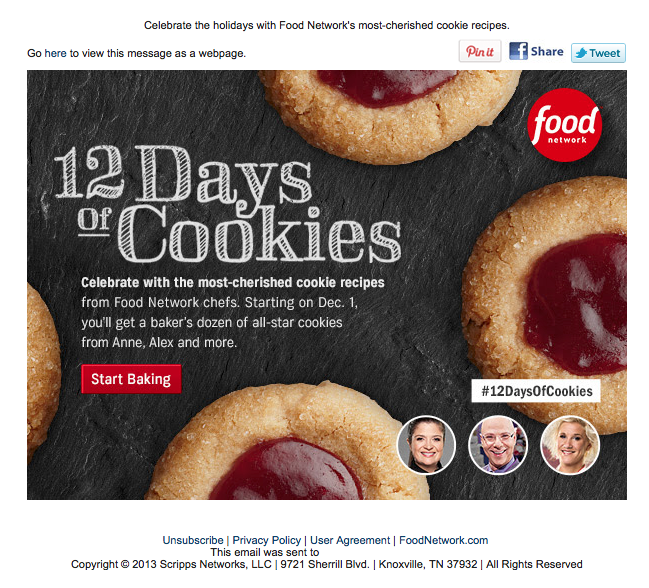 The Food Network markets one of its shows with “12 Days of Cookies.” The newsletter is simple and down to the point. You will also notice that the hashtag “#12DaysOfCookies” is included, which subtly encourages cross-media engagement. Subscribers can use the hashtag and be a part of the conversation. From a business’s point of view, it is a great way to encourage communication and community interaction and stay up-to-date with what the public is talking about in relation to the campaign. Why do we like it? I Heart Daily‘s 12 Days of Love Letters is a really sweet and thoughtful campaign that encourages people to spread love and cheer during the holiday season. While most companies are focusing on selling, I Heart Daily’s campaign takes on a giving role. 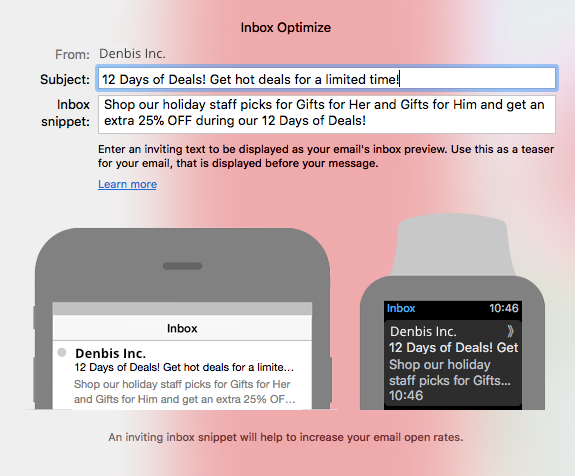 Tip: Your 12 Days email campaign does not have to be about selling. You can encourage people to give back to the community and reward them with a voucher. Or you can create 12 days of giveaways to show that you appreciate your subscribers. Extra tip: The “12 Days of…” campaign has grown in popularity amongst different industries. You will notice many businesses employ this promotion during the holiday season. Although it is currently not at the same caliber as Black Friday, 12 Days of Deals is still one of the biggest sales promotions during the holidays. You can choose to divide the 12 days with 12 different newsletters or include all 12 deals within 1 newsletter. Why do we like it? Costco sent out a different newsletter for each day of the 12 days. With each passing newsletter, Costco included all of the deals from the days prior. But what’s even cooler is that Costco updated the current stock of the items by informing subscribers if the item is sold out or not. Why do we like it? 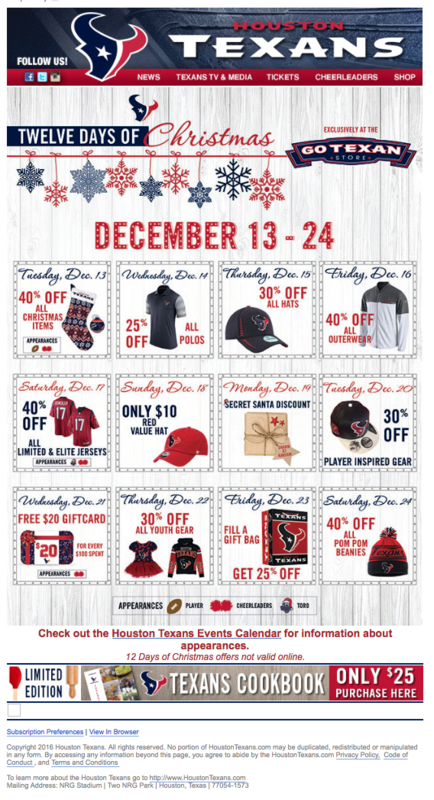 The Houston Texans created a newsletter that is very well-organized. People can see the deal of the day for each of the 12 days, making it easier for subscribers to plan ahead. Disclaimer: equinux AG and its subsidiaries are in no way associated, affiliated, authorized, endorsed by, or in any way officially connected with any of the organizations or brands mentioned in this post. The use and mention of these organizations and their respective websites, pages, and products/services are strictly for educational and descriptive purposes. They provide useful information about the topics discussed. No commercial claim to their use, or suggestion of sponsorship, or suggestion of endorsement, is made by equinux AG and its subsidiaries.